As I am wont to do when I watch any movie, I post a screencap on my Instagram. There are some awesome movie fans with great IG accounts out there, and I am proud to be a part of that. One of these followers of mine commented on my post for the newest installment, the second of three (maybe? ), of The Divergent Series. It went something like this: "otherwise known as the other Hunger Games." To which I replied: "And so not as good. Yep. Hunger Games Lite." And that's true. It's just not as good. It comes in a string of dystopian science fiction young adult trilogies desperately trying to attain what Suzanne Collins so perfectly captured with her novel The Hunger Games, first published way back in 2008. A planned trilogy, the next two novels followed in the subsequent years, and took the YA Lit world, of which I (as a middle school English teacher) live and breathe but rarely read, by storm. Then came the others. Most loved by the girls in my middle school English classroom is Veronica Roth's Divergent, and it's sequels, Insurgent and Allegiant. The first Divergent film was good enough. I didn't love it, but it wasn't awful. Plus, my wife LOVES the books, so I was willing to humor her. The premise is cool but doesn't make a whole lot of sense. What's left of the population of Chicago, after some sort of apocalypse. has been divided into five factions, each representing a sensibility and named with a vocabulary word (Abnegation, Erudite, Candor, Amity, Dauntless). Though Erudite is the best of the vocab words, they are also the villains. That makes sense...make the smart people the bad guys. Dauntless, the easiest of the vocab words to figure out, is a group of hootin', hollerin' badasses, who serve as the fighters and protectors of the city. 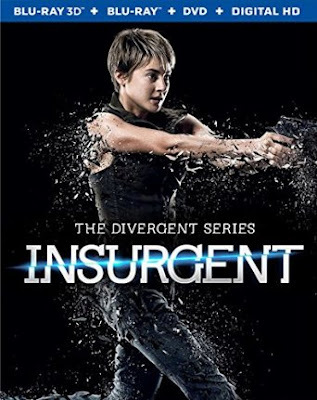 Tris (Shailene Woodley) is Abnegation, but she wants to be Dauntless. I mean, who doesn't? At the choosing ceremony, she gets to choose (as all do) but she is one of the few who gets to choose blind. She is "Divergent," meaning she tested into traits of all five factions. This is dangerous to the Erudite establishment run by Kate Winslet. Different is dangerous. Training montages. Clashes among the rookie Dauntless. Tragedies involving family members hiding major secrets go down. Kate is defeated...sort of. End of first movie. 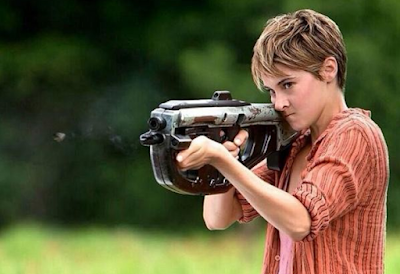 Insurgent picks up right where Divergent left off. And it's essentially like watching the same exact movie, which, well, I'll be honest...it pisses me off. Now, to be sure, the plot is different...it's a continuation, but it looks and feels and has the same lack of development as the original. I may actually give this one the edge in that it at least gives us a look at the Candor and Amity, which are pretty much totally missing from the first film. And, as much as I love Shailene Woodley, her co-star (and love interest), Theo James literally has nothing in the way of matching her charisma. He's just pretty. This is a film that features Miles Teller (her love interest in the beautiful Spectacular Now) and Ansel Elgort (her love interest in the little girl cry fest The Fault in Our Stars), and, sadly, it doesn't seem to realize that those two guys can act James under the table and already have an established chemistry with the lead. That makes no sense. 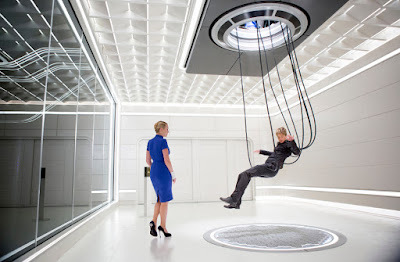 Naomi Watts pops up in a few scenes this time, as Four's (the Theo James character) long-lost mother. Her talents are wasted here. Winslet is hardly in it. Wasted. There are some ingenious action sequences and set-pieces and some really nice CGI, but even those just skim the surface as far as true meaning is concerned. It's just a series of movies, so far, that just doesn't go all the way in any aspect. And it hurts even more when compared to The Hunger Games. Take the second installment of The Hunger Games, 2013's Catching Fire. It boasted a new director, as this film does, and it set a goal to dig deeper, likewise. The difference is that it reached its goals. It is the best movie of its kind yet made. Insurgent is Hunger Games Lite. Better yet, it's Catching Fire Ultra Lite. The first one sucked...so much. I won't be seeing this. At least I hope not. My bestie and his wife loved the first one and were the ones who convinced me to watch it. I have a feeling they may ask me to watch this with them too...if I don't move first. I totally overrated the first one last year. I think I was just trying to be nice. My wife is gonna be pissed when she reads this. Hope the moving situation is going okay. I actually kinda like this one... I do realize it's not technically very good but it's enjoyable enough. There's not that many action-filled YA movies out there so I appreciate the effort they put into that. I won't say I didn't enjoy it at times. I did. It is definitely "enjoyable enough." What gets me is how much better it could be.